I was talking to Kristine Jackson at Gauleyfest last year where she told my about this. I had been making foamies for 4 years and had never heard of this. Hope to make this happen again! A video of some of Foamie George's Foamies. George's boat are where it all started for me. 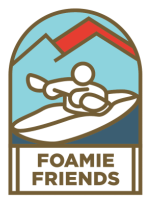 These Foamie Boating Videos below by others are from the World Wide Web and may NOT be appropriate for children.